Omlet Gift Cards now Available! What could be better than buying the one you love an Eglu Chicken Coop? Treating them to an Omlet Gift Card instead! With a gift card the lucky recipient will be able to choose whichever Eglu they like. (Perfect if you don’t want to risk making the wrong colour choice!) 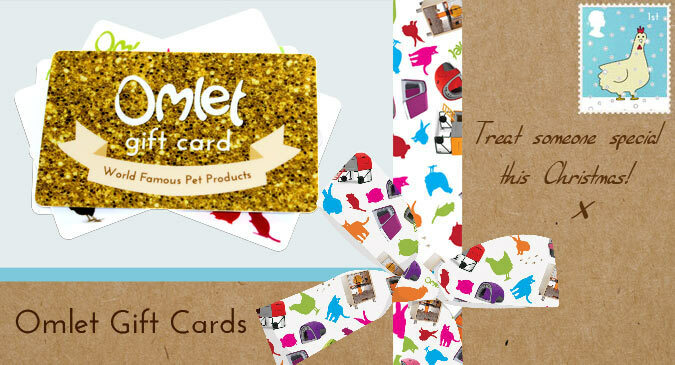 Omlet Gift Cards come in whichever value you choose, up to £500, meaning they can be used on a huge range of products, from the stylish Qute Hamster and Gerbil Cage, to the iconic Eglu Classic Chicken Coop, to a novelty egg cup or two. The perfect flexible present for any occasion, Omlet Gift Cards can be bought in any denomination, from £10, so why not make a start to your Christmas shopping and order one today! ?